Butternut squash never tasted so good. Turn a fall favourite vegetable into a simple side dish with a touch of cream cheese, a sprinkling of brown sugar and a dash of ginger. Combine 2 cups mashed cooked butternut squash with 1/2 cup Philadelphia Light Cream Cheese Product, 1/2 cup dry bread crumbs, 2 Tbsp. brown sugar, 1 egg and a dash each of ground ginger, pepper and salt. 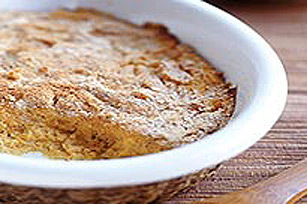 Place in a greased shallow baking dish (1 L). Sprinkle with additional 1/4 cup bread crumbs. Bake at 350°F for 30 min. or until lightly browned.